When observing the different posters in the exhibition I was especially interested in the pieces from the Haiti Poster Project. I liked this poster by Brittany Phillips because her use of material was directly related to the message the poster gave. I thought it was a creative concept and gave off a very powerful message. 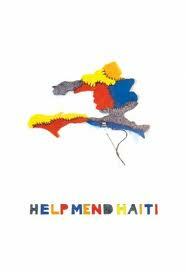 In some ways I felt as if I should contribute to the mending and rebuilding of Haiti. Unfortunately it is tragic events such as these that creates a feeling in people from all over to come together and help the victims overcome this hardship. I think this poster as well as the others gives off this feeling.